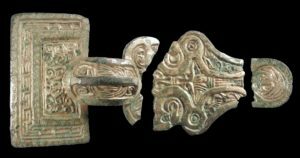 UNIVERSITY OF SHEFFIELD—Archaeologists from the University of Sheffield have uncovered a previously unknown Anglo-Saxon cemetery. The finds were typical of those found in early Anglo-Saxon burials therefore it was necessary to excavate the site to ensure any further artifacts were retrieved, recorded and preserved before they could be destroyed by agricultural activity. Dr Katie Hemer, Lecturer in Bioarchaeology at the University of Sheffield, said: “Analysis also extends to a number of the finds, including the amber beads, which are being provenanced in collaboration with colleagues from Sheffield’s Department of Physics; we will analyze the elemental composition of the metalwork and identify the elephant species which produced the ivory rings.